First-crop sire Apollitical Blood got his first graded stakes winner on Wednesday. 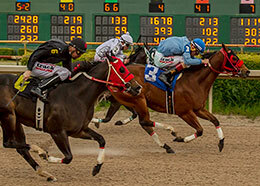 BREAUX BRIDGE, LA—MARCH 20, 2019—AQHA Racing Champion Apollitical Blood got his first career stakes winner and first graded stakes winner on Wednesday when fastest qualifier Trump My Record returned to win the $254,070 Harrah's Entertainment Futurity (G3) at Louisiana Downs. After getting away slightly slow under jockey Eddie Sanchez, for trainer Arturo Davila III, Trump My Record ran down stablemate Baby Licious in :15.307 seconds, a 102 speed index for the 300 yards with a 10 mph tailwind. Purchased by owner Cruz E. Nava for just $10,700 at the TQHA Yearling Sale, he was impressive in his schooling race on February 9, before setting the fastest Harrah's qualifying time in trials on March 2. Trump My Record's dam Breck N Records, by Pyc Paint Your Wagon, is a half-sister to Aha Moment, third in the All American Futurity(G1) and Grade 3-placed Man Who Wouldbe King. The second dam, Thrill And Grace by Mr Jess Perry, won the Harrah's Entertainment Derby(G2). Quien Sabe Ranches, LP is the breeder. Trump My Record earned $114,332 for today's victory and Davila and Cruz are considering supplementing him to the Grade 1, Heritage Place Futurity at Remington Park. Through March 20, Apollitical Blood has sired three winners from nine starters with average earnings per starter of $15,810. Today's win will push him to the top of the leading first-crop sires and sires of 2-year-old money earners lists this week. Owned by Rancho El Cabresto, Inc., Apollitical Blood is by last year's leading sire of money earners Apollitical Jess, also owned by Cabresto. In only six crops to race world champion Apollitical Jess has sired 100 stakes horses (13%), earners of more than $23.8 million and average earnings per starter over $55,000. His son looks to follow in his footsteps. Apollitical Blood is out of the grade 2-placed Fishers Dash mare Brazilian Dasher, dam of 6 ROM winners from 9 starters including four black-type winners. Out of grade 1 winner Dinastia Toll Brz, Brazilian Dasher is a half-sister to champion and world champion sire FDD Dynasty. This is also the family of 2018 Rainbow Futurity(G1) winner MM Fourinthemorning. Apollitical Blood stands for a 2019 fee of $5,500 at Robicheaux Ranch, Inc. in Breaux Bridge, Louisiana. 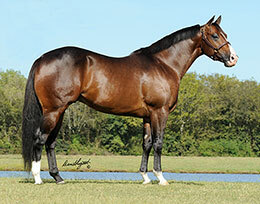 For additional information or breeding contracts call Ryan Robicheaux at 337-845-5130.